Whether creating a large-scale marketing event or a more subdued office function, corporate events can be challenging times for party planners. Make sure next time you’re planning a party, yours is a success. With precise planning and forward thinking, you can free yourself on the night to focus on creating the best possible atmosphere for your guests. 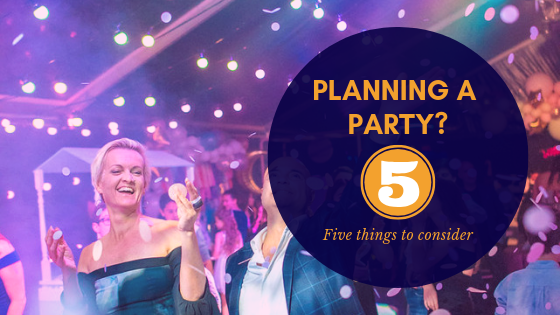 Choosing when the party will occur is important – you should consider if there are any upcoming major holidays that may affect both venue and guest availability. Check local council information or a similar body if you are unsure of the dates. Also, it’s worth checking with your seniors in the company as there may be unexpected meetings and other important events scheduled that you are unaware of. Finding the right venue can be one of the most stressful parts of throwing a party. You need to take practical factors such as size and location into account – will it accommodate your whole invite list and is it easily accessible? Party planners should also consider more abstract factors too, such as ambience and decorative features – are there ways the space can be enhanced with architectural lighting or sound systems? Once you’ve got a date and venue in mind, arranging invitations should be next on the agenda. Ensure that all the relevant people are invited and account for both some last minute drop-outs as well as additions. Having an RSVP can help you estimate how many people to expect on the night but this is never an exact science so have some flexibility with numbers. Depending on the length and type of party you’re throwing, you’ll most likely need nibbles and drinks, if not a full-on dinner. For this, it’s wise to consult with a catering company that can often provide a complete service, including staff to ensure you have one less thing to worry about. Give your guests an evening to remember with live entertainment – whether you choose a band, a DJ or another treat, these are likely to require venue services to be enjoyed to the fullest. Be sure to work with a professional sound and light company that can advise you on which systems will work best with your party theme and technical requirements. The experts at Pro Light & Sound are full of excellent advice on how to deliver a remarkable event guaranteed to wow your guests and have a measurable ROI. If you are planning an event, get in touch with us today! What are you interested in?